My work has me at an event at Hotel 1000 in downtown Seattle today, and their restaurant is called Boka. I always get nervous when I’m on site at an event and subject to whatever food might be available – and whatever chef might be cooking that day (if they know/care about the needs of those of us with celiac), etc. I must say, I was pleasantly surprised with Boka. Their menu has several gluten free options – and they are noted right on the menu (always a plus). That helps to ensure in my mind that the staff all know why gluten free is important, and not just a fad. I got the blackened salmon tostada, and it is delicious. It has a great mixture of flavors and textures (crunchy corn tortilla, mixed greens, flaky salmon and whipped avocado mousse that I loved). It is savory, with some nice tartness (lime), spice and saltiness that balances together well. The staff I talked to was friendly and knowledgeable. They knew about celiac disease and how to handle food for me. 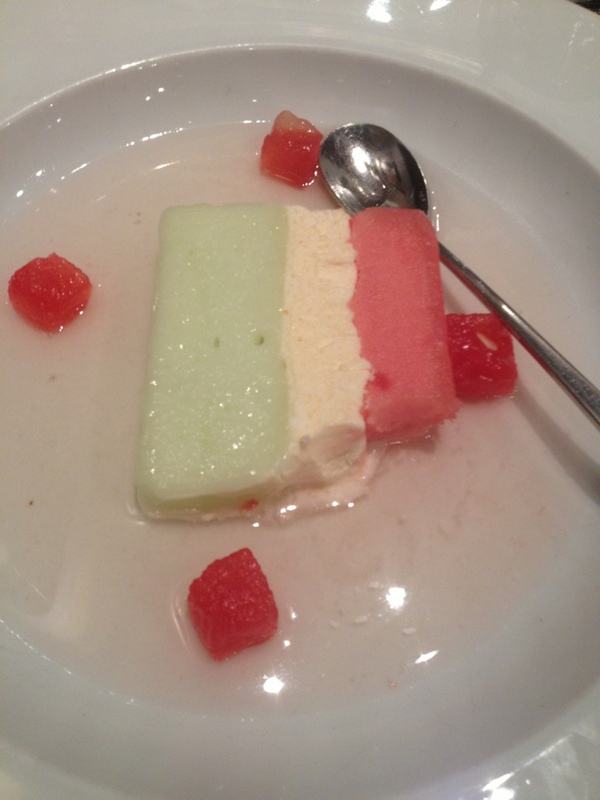 They even came out and offered me a gluten free dessert – the “melon medley”. I’m not gonna lie, this dessert is pretty awesome! Check out the picture below. The perfect cap to a delicious lunch in downtown Seattle. What is an Upper Endoscopy Like? When you have autoimmune issues, like celiac disease, “endoscopy” is something you get accustomed to pretty quickly. Although, the majority of people have one, get diagnosed, change lifestyle, and don’t need one again…when you continue to feel sick the doc may schedule more than one. The first two I had (upper endoscopy and colonoscopy) were done before I started my blog. So, since I am having another upper endoscopy today, I thought I would explain the prep and what the procedure is like. First, it’s super easy. If you’re going for one and haven’t had one before, don’t worry. The upper endoscopy is a procedure where the doctor takes pictures or samples of your small intestine. The easiest way to get there is through your mouth. I know, that may sound awful, but you’re asleep during the procedure and don’t feel anything. the day before the procedure you can’t take certain medications or aspirin – they will discuss your specific mess with you. at some point (some say the night before, my current doctor said at 9:00 a.m. on procedure day) you can no longer have anything to eat. for the next phase (in my case, 9:00 a.m.-12:00p.m.) you can only have clear liquids. This is such a short period of time that I’ll just have water, but sometimes the “clear liquid diet” goes a lot longer. In that case, you will be pleased to know many juices, Popsicles and broths are ok during this phase. No milk and nothing with red food coloring, because it can look like blood in the scope. That’s it for prep! Easy peasy. Now, you go in for your appointment. They may take stats again. You will change into your glamorous gown and get prepped for an IV (I also dislike needles so I don’t love this). You get on the table, and they start the fluids and potentially a mask you breathe into as well to knock you out. The actual procedure usually takes 5-15 minutes depending on what they are doing/looking for/find and then you’re done. Once you wake up from the meds, you get dressed and have a chat with the doctor about the findings. Now all I have to be concerned about is my results…wish me luck! Filed under Medical Tests, What is Celiac Disease? I have not been feeling well. And, when I really started to examine my symptoms, I realized they have been going on for quite a while – at least six months. I’ve had stomach issues, incredible lethargy, headaches, and just all around feeling like garbage. I feel a lot like I did three years ago before I was diagnosed with celiac disease. If you know me in person or really read this blog, you can attest to my strictness on the gluten free diet. I don’t sneak cookies every once in a while or bend the rules. I am definitely living the GF lifestyle. I am really careful about cross contamination as well. To see if it would help me feel better, I recently (about two months ago) stopped eating sugar. I’m off refined sugar, artificial sweeteners and high fructose corn syrup. I feel less hungry and a little better I guess…but something is still wrong. I thought, “Maybe it’s dairy? Maybe I should stop eating all carbs? Should I go paleo?” Before doing anything drastic and cutting every food category in the book, I opted to consult with my gastroenterologist. I’ve researched a lot before going in – hearing others talk about leaky gut, lactose intolerance, GFCF and more. So I thought I was prepared for what the GI would say. I researched (obviously) as I walked out the door of the GI and I’m not too excited about the options. Apparently, refractory celiac disease is really rare – <10% of those with celiac disease have it. It is a condition where even eating a strict gluten free diet doesn't repair your intestines and you continue to have symptoms. Which led me to ask myself, "What are the options for feeling better?" There are two types – type 1 which is less severe and type 2 which is rarer and more severe. Type 1 puts you on nutritional support which provides nutrients/food through intravenous means to bypass the intestines. And could include a special liquid diet. You also probably have to start taking steroids. Yay. Type 2 is classified by many as non-Hodgkin lymphoma – you can read up on that if you want. Not a good option. So, I go in for my endoscopy in one week and I've been sitting with this question for a week already. I asked the doc what he thought it could be if it wasn't RCD, and he said it might be IBS. I hate the thought of something with no real relief in sight. So…I don't know what I'm hoping for when I go in next week. I just want to know what I'm dealing with so it can start to be fixed. Is that too much to ask? Learn more about refractory celiac disease. Thoughts, tips or questions? Send ’em my way. I’ll keep you posted on what I find out. Filed under Changes, Daily Life, Medical Tests, What is Celiac Disease? Gluten free diets have become – shall we say – trendy – over the last several years. Some followers opt in simply to lose weight or see what the hype is about. But for many, it’s a health necessity, not a choice. Like patients with celiac, pleural mesothelioma patients may also experience these conditions. Some issues, like abdominal pain, are primary symptoms of their cancer. Others, like nausea and diarrhea, are side effects of their treatments. While they’re caused by different triggers, mesothelioma patients’ symptoms can also be managed through diet. Gluten-free foods may help alleviate some of these symptoms. Fiber-rich, gluten-free grains like brown rice and quinoa can help stimulate digestion during bouts of chemotherapy-induced constipation. Soft, bland foods can help quell post-radiation nausea. While most people associate “comfort foods” with macaroni and cheese, buttery toast or similar gluten-heavy items, options like mashed potatoes or rice crackers fit the gluten-free bill. Carb-rich foods are concentrated sources of energy for periods of mesothelioma-related fatigue, but they don’t need to be limited to pastas or sandwiches. Complex, gluten-free carbohydrates like sweet potatoes and beans can provide a major energy boost to get through the day. Beyond using gluten-free foods to address specific mesothelioma symptoms, patients may also use a gluten-free diet to reduce inflammation in the body. By avoiding this protein for a prolonged period of time, the digestive system gets to rest and focus on calming internal irritation. While a gluten-free diet may not be medically necessary for mesothelioma patients the way it is for celiac patients, it certainly holds power to help them feel a bit better after their initial prognosis. If you’re considering adopting such a lifestyle, bring it up at your next oncologist’s appointment before making the switch. Faith Franz is a researcher and writer for The Mesothelioma Center. She advocates for alternative medicine and encourages cancer patients to explore all of their treatment options. For those of us that have been gluten free for a while, this seems like an obvious question. However, I want to make sure this blog helps everyone – especially the newly diagnosed – so I’m adding in some of the basics. I remember when I was first diagnosed, when I started to hear what gluten was, I had the same thoughts. This also led to thoughts/questions about corn, potatoes, quinoa, spelt and many more. I will have more posts about those grains (and others) soon. In short, yes, rice is gluten free. You are safe eating it, but watch out for accidental cross contamination. You done want to boil rice in a pot that just had whole wheat pasta or something. And, traditional soy sauce is not gluten free (neither is teriyaki sauce – which is comprised of soy sauce and other ingredients) but there are alternatives. I use gluten free tamari and can’t tell the difference. It is available at almost any grocery store in the Asian foods section. So, eat all the rice you want and watch out with eating in Asian restaurants (because of the soy sauce). It isn’t traditional Chinese food, but PF Changs is a great option for gluten free. They use separate bowls and plates and cook with different pots and pans – gluten free shrimp fried rice is one of my favorites! They have complete meal options and a large gf menu. Do you have any gluten free recipes using rice that you love? Here is a video that just came out from the Mayo Clinic (a little slow and dry…but considering the source that makes sense) about a recent study on Larazotide Acetate – a pill that could help people with celiac disease consume gluten. What do you think? Would you eat gluten again if there was a pill that came available? Or, would you stay gluten free? Filed under Changes, Medical Tests, Nutrition, What is Celiac Disease? I was diagnosed (officially) with celiac disease on July 30, 2010. It was a Friday. Yes, I remember the day and everything about the lead up to that moment when my doctor’s office called to confirm what I already knew – I had celiac. Since then, I have been researching and writing and changing my life for the better. Around me, I hear from friends, family, acquaintances, people in the coffee shop, etc. that they or someone they know was just diagnosed and doesn’t know what to do next. Obviously, this has been around for years, but I hear all the time that it seems like diagnosis of celiac has been increasing dramatically in the last five years. It sounds right to me, but I wasn’t really aware of this before my diagnosis. I remember saying “You think I’m intolerant to…what?” When the nurse called me to discuss my blood work. I actually had to have her spell gluten for me. So funny to think how my life has changed. A word I had never heard of three years ago I say 10 times a day now. Anyway, there was recently an article on the rate of diagnosis of celiac disease in the Huffington Post that contradicts what I have always heard since my diagnosis. It says it went up dramatically from 2004-2008 and has plateaued since then. The exact opposite of what I’ve heard. I was diagnosed during “the plateau” and I’m curious how many of you were too. Please, let me know so we can test their theory. Filed under Changes, Medical Tests, What is Celiac Disease?